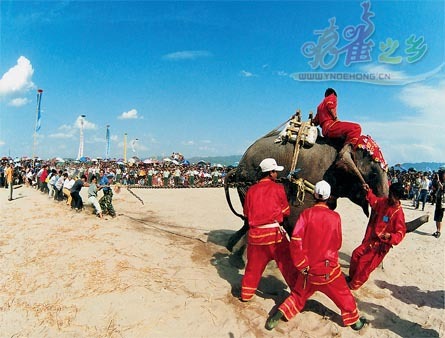 From July 10 to July 15 of 2004, the prefecture organized teams to participate in the Sixth Yunnan Farmers’ Gymkhana and exhibited a distinguished performance, in which the teams won 2 golden medals, 3 silver medals and 6 bronze medals in the 5 programs of track and field, swimming, Chinese chess, martial art and militiaman military skills of the three subjects for the matches; Dehong Prefecture had fulfilled zeroth breakthrough for golden medal since the previous Farmer Gymkhanas, generalizing a passel of national sports items and creating “oxcart match”, “Jingpo calisthenics”, “Dai calisthenics” and other distinguished minority sport items. 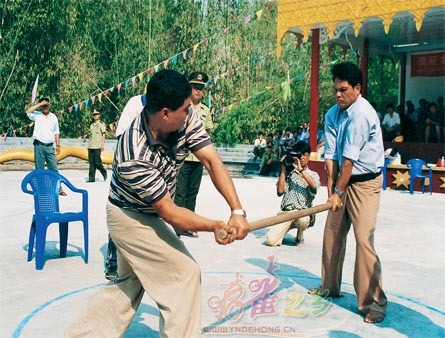 From September 6 to September 13 of 2003, Dehong Prefectural Team won 4 golden medals, 2 silver medals and 2 bronze medals in the five athletics items of whirligig, shooting arbalest, Shuangguai, swing, martial art and two other items of Dai people’s Gahuan, Jingpo people’s Gechangdu, which were the best outcome in all the previous Yunnan National Sport Meets. During the days from May 7 to May 15 of 2005, Dehong Prefecture organized teams to participate the Eighth Yunnan Sports Meet for the Disabled and the Second Yunnan Special Olympic Games in Kunming and won excellent scores of 7 golden medals, 6 silver medals, 4 bronze medals in the 23 minor items of the five major items for the weight lifting, track and field, swimming, blindman croquet and swordplay on the wheelchair; it sent 2 disabled athletes to the National Team, 5 to the Provincial Team. The traditional ethnic sports that originated from the productive labor work had a long history with the rich colorful resources in Dehong Prefecture, in which shooting and martial arts that were closely related to hunting and weapon fighting were particularly popular in the local area. In history, The Jingpo people had the saying “Man is not regarded as a genuine man without mastering the skills of flourish sword.” ; for De’ang people, there was a proverb “Boxing is the outshining flower for a man”; nowadays, there still exist 11 more ancient military practising sites in the area of Luxi city. The other ethnic sports activities containing additionally the recreational and dally functions, such as thin bamboo strip catapult, shooting arbalest, riding swing, climbing ladder of swords，walking in the sea of flames and other sports can also be found to have an extensive foundation among the mass, by which people amuse themselves in their routine labor and joyful festivals. With the social developing, some sports programs have made a combination with the modern athletics sports and have been listed as the sports programs in the national and provincial competitions. The modern physical training in Dehong Prefecture started from the time of the Republic of China. They were carried out originally as the teaching subjects of physical training in elementary schools；these subjects included basketball, volleyball , high jump, long jump, sprint and other sports subjects. In the second year of the founding of the Republic of China (1913 ), the Jiubao Elementary School held an elementary school sports meet, which was the earliest athletics match of modern physical training in Dehong Prefecture；hereafter，some physical training programs were spontaneously gradually launched among the mass, among which football games in Yingjiang once became the vogue of the time in the middle of the 1940s and football teams were organized in Shapo village，Jiucheng Street，Xingcheng Street，Longzhang Street and Mangyun Street, people held the football match irregularly. After liberation, the levels of football skills in Yingjiang area still stayed on the top of the prefecture. In company with the army garrison, the establishment of the government offices, the organizing of the enterprises and the public undertakings, the incoming of the inland youth for supporting the border areas and the teams for wasteland reclamation, the sports matches were held more frequently and mainly for basketball. Afterwards, along with the conduction of physical training in schools and the settling of the returned Indonesian Oversea Chinese in the border areas, some new sports programs, such as table tennis and badminton, also became prevailing and developed. From 1958 to 1960, as the administrative institutions of physical training established gradually in the counties of the prefecture, the physical training cause developed progressively; facilities for physical training improved gradually and the athletics level escalated; the Team of Dehong Prefecture entered the fourth place in the Staff and Workers’ Gymkhana of Yunnan Province; all kinds of physical training matches for the mass were launched gradually. When “The Great Cultural Revolution” started, the Committee of Physical Training was dissolved and the job of physical training fell into paralysis. In 1972, a tournament including basketball、volleyball and table tennis was held in Mangshi area. In 1974, the Prefectural Children Sports School was set up and began the professional physical training. In the middle of the 1980s, the work for physical training in Dehong Prefecture reached a healthy stage of developing, particularly it achieved excellent progress for the athletics sports. From 1958 to 2005, the Athletes of Dehong Prefecture won 8 golden medals in the international matches and 16 golden medals in the nationwide matches; in the provincial matches, 464 golden medals were won; 576 silver medals and 464 bronze medals were won; there were 108 times for breaking the provincial records, 4 times for breaking nationwide records and 2 times for breaking Asian records; the well-known international athletes such as Libaolian, Liuyunhong, Chenghongwei and other athletes had been trained and grown in the prefecture. During the period from 2003 to 2005, 8,040,000 persons of the mass for all nationalities participated in all kinds of physical exercise and 2,680,000 persons in physical training and physical fitness activities.